The perfect brownies, crispy outside and soft inside. Preheat the oven to 160 °C (325 °F). Butter a 33 x 23-cm (13 x 9-inch) pan. In a double boiler, melt the chocolate while stirring. Set aside. In a bowl, cream the butter and sugar with an electric mixer. Add the eggs, one at a time, and beat until the mixture is light and creamy. While beating, add the melted chocolate and vanilla. In another bowl, sift together the flour and baking powder. With a wooden spoon, stir the dry ingredients and pecans into the chocolate mixture. Pour into the pan. Bake in the middle of the oven for about 25 minutes or until the edges of the cake are firm and crisp. Cool in the pan. In a small saucepan, melt the chocolate with the butter and water over low heat until the mixture is smooth. Set aside. In a bowl, beat the cream cheese. Add the chocolate mixture. While beating, gradually add the icing sugar until the frosting is smooth. Frost the cake evenly. Cut into squares. If desired, serve with vanilla ice cream. A little trick when baking brownies ... rely on your nose. As soon as you can smell the brownie, you should begin to monitor it closely. 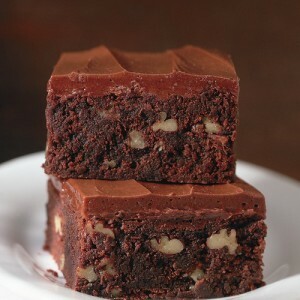 When the edges of the cake are firm and crispy, remove the brownies from the oven, even if the center may seem a bit soft. Let it rest at room temperature for 2 hours. And therein lies the secret of the perfect brownies, crispy outside and soft inside.